Recently, I have been in need of flavour and colour to brighten up my dreary winter days but what? Portsmouth is bustling with great choices for food and no matter where I look there is always a new place to tempt me. But, with how bitter the weather has been, I needed something special to bring back the sunshine. It couldn’t be any old place so I found myself at the newest addition to Clarendon Road – The Fisherman’s Kitchen. Oh boy what a good decision! Opened in August this year, The Fisherman’s Kitchen adds a unique twist to an English classic. Compared to coffee shops, fish and chip shops are limited in Portsmouth and even fewer are sit down restaurants. After my enjoyable trip to the Deep Blue restaurant on the pier, I wondered if this new establishment, of similar grain, would be just as good. Spoiler alert: it was even better! The outside is eye-catching with a vibrant turquoise sign and inside is just as colourful and fresh with blue tiles, copper tables, wooden chairs, chalkboards and mirrors with fish decals. It is airy and clean, pristine even, and as I entered I was met with a friendly member of staff who too looked very presentable. Already we were on to a good start. The opening times for The Fisherman’s Kitchen are normal chip shop hours. 11:30 – 14:30 Monday to Thursday, 11:30 – 22:00 Friday and Saturday and 11:30 – 20:00 on Sunday. There is a takeaway option but delivery has not been added yet. The menu is fairly large with lots of seafood choices including calamari, crab burgers, Moules mariniere chowder and a Malaysian seafood curry. 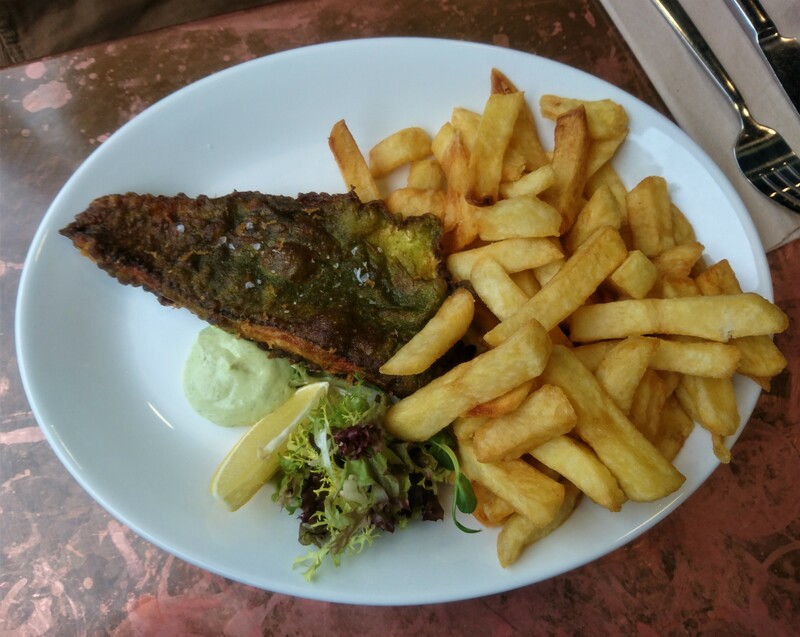 There are traditional options too including fish and chips with a choice of bass, cod or hake and sausages either battered, plain or with an onion crumb. They have some unique items but sadly their vegetarian options are limited to only two – halloumi burger or veggie fish and chips. They always have specials on offer also including their famous loaded chips which always boast mouthwatering toppings. Today there was the ultimate cheesy chips with four different kinds of cheese – halloumi, mozzarella, parmesan and cheddar. Previous times I have seen cheese and bacon and even roast beef. Grabbing a napkin to wipe away my drool, I ordered the tempura prawns and a curry sauce and my friend had the battered bass. Both came with unlimited chips. For a drink, I chose their blood orange lemon-aid, a tasty fruit drink with a gentle fizz. As I waited for my food, my drink was given to me alongside some napkins and cutlery. In the background, Bruce Springsteen belted out Hungry Heart and a smile played on my lips. The atmosphere was just right inside The Fisherman’s Kitchen – warm and welcoming. On my previous visit, I ordered the seafood curry which was presented to me on a large white plate. 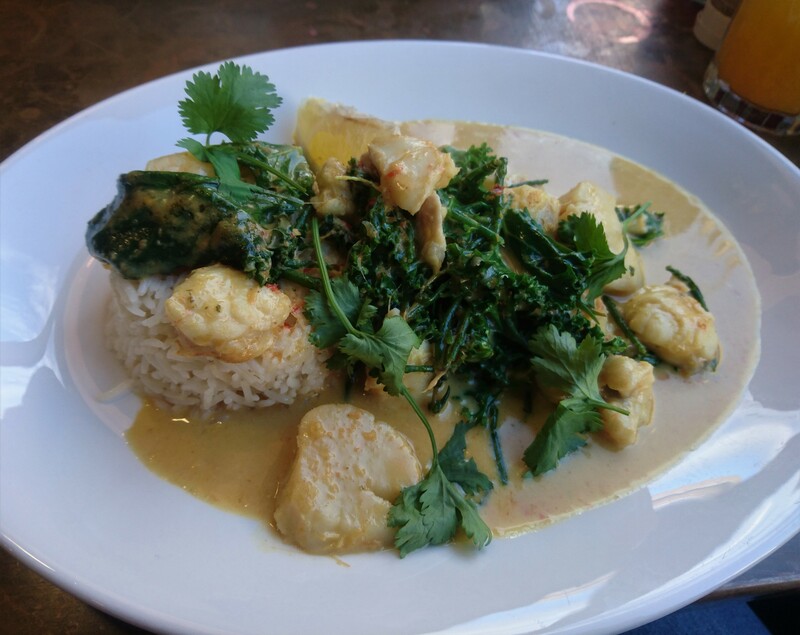 There was a heap of coconut rice and a creamy sauce holding thick chunks of cod cheeks, monkfish, king prawns and scallops. It’s the most expensive thing on the menu at £13.50 but that’s still a reasonable price. The portion was generous and the flavours erupted in my mouth. The curry wasn’t too spicy and was similar to a Thai Green with a slight kick behind the fragrant mouthfuls. There was plenty of fish with every bite. I definitely recommend it to anyone. The meals, when they were brought over, were presented beautifully. 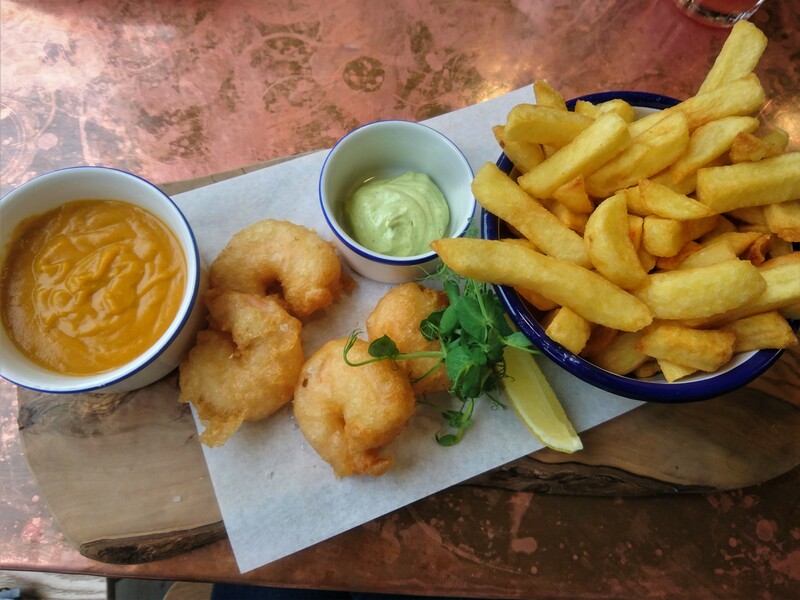 There were 4 fat prawns placed on a wooden board and a tin pot bursting with steaming chips. It came with a garnish and a side pot of tartare. The batter was golden and delicate and the prawns were chunky curls. In one bite, there was so much flavour and the batter, unlike most, was rich and light. Although, the bottoms of a few were a tad soggy. The chips were some of the best I have tried in a long time. Thick cut. Crispy on the outside. Fluffy on the inside. You could tell they were cooked there and then rather than left in the chip box to go soggy and hard over the course of the day. The sauces – curry and tartare – were also flavoursome. The curry sauce was proper curry sauce. It was orange, creamy, sweet and slightly spicy. If you closed your eyes you could be fooled that you were in an actual Indian restaurant. The tartare was slightly different from normal. It was thick as well and a mustardy aftertaste. It was tangy and complemented the fish brilliantly. The bass was interesting. The batter was light and crispy again but was also made with ginger beer and coriander. The result was a unique batter with a fragrant aftertaste. It added something extra to the soft, white fish inside. The waiter cleared the plates and as he did so he offered us dessert – a battered brownie with hazelnut praline. Nursing my full stomach I refused. I could barely finish my whole meal, let alone a dessert too! The price was very reasonable at £24 for two people. At £12 each for a drink and a large, fresh, high-quality meal you can’t go wrong. The Fisherman’s Kitchen is one of Portsmouth’s foodie assets and is a top contender for one of my favourite eateries. Its atmosphere is lively and vibrant and the food is unique, affordable and nothing short of mouthwatering. The only downside though is their lack of vegetarian options. 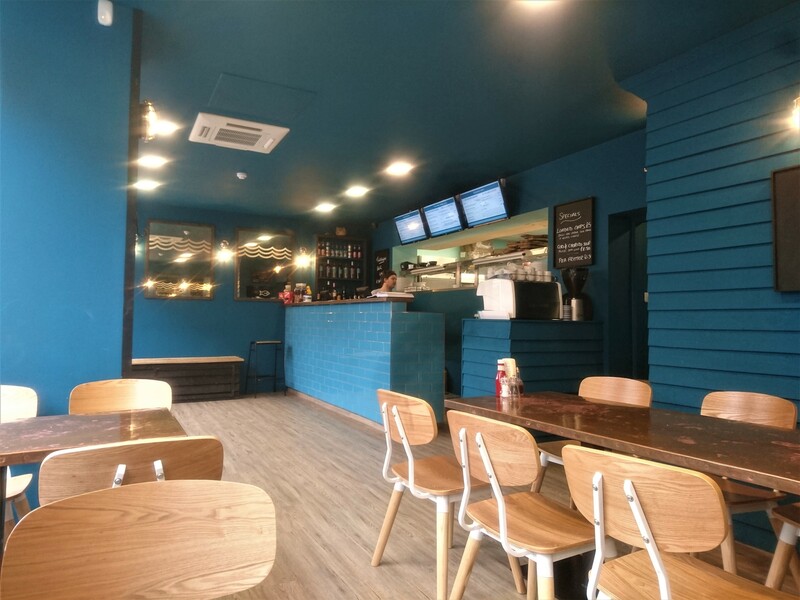 If you are looking to eat fresh food, bursting with character and colour then I definitely recommend The Fisherman’s kitchen – the new kid giving existing chip shops a run for their money.